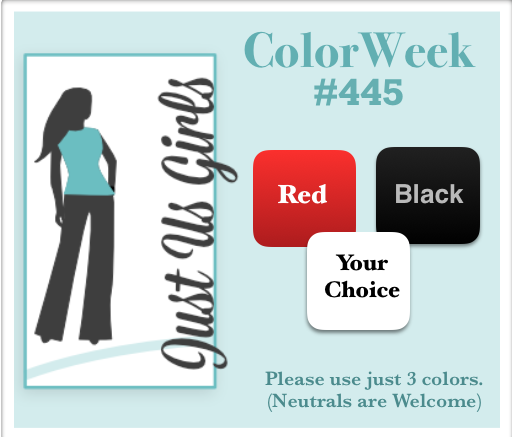 Hello, Today’s card is for Color Week at Just Us Girls. It’s nothing special but it fits the challenge just the same. I needed a specific masculine card for a friend and this is all I could come up with. Masculine cards are so tough! I have chosen grey as my 3rd color choice. I always enjoy these type of challenges where you can throw in your own color. Please come on over to Just Us Girls and see what my team and our talented Guest Hannelie chose for their 3rd color! Categories: Cards | Tags: Card making, Cards, Happy Birthday, Masculine cards, rubber stamps, stamping, Stamping Up | Permalink. The layout is spectacular and the colors work really well together. It is a great masculine card. I think this ‘all you could come up with’ card fits your goal wonderfully! I agree – masculine cards are challenging – but you’ve nailed it with your eye-catching, star-studded. red/black/grey creation! Masculine marvelous in every way! I’m sure your friend will love this star-studded card, Nancy. It has such a great design layout and the gray goes beautifully (or should I say handsomely?) with the red and black. What? Nothing special? Great job with these colors and a masculine card too. I think it is a great design and so special with the number too. Great masculine card Nancy. Love the colors and the layout design. Great birthday card – I love gray with red and black! Your design is really so bold and perfect for a guy! Fantabulous creation here Nancy. Very clever layout and perfect colour choice. Super male card. This is an awesome design and a perfect masculine card! Love all of the stars going on and that tag with the 62nd. You nailed it!